4-Exporting forms easily from Microsoft Visual Studio Designer to FuchsGUI :D.
5-The future of FuchsGUI & some notes. This part of the tutorial is the last part of the series.. I don’t know how to organize this post since it’s not a tutorial 😉 so I’ll start with some notes on FuchsGUI. As you saw each control takes a Texture2D parameter in the constructor, well… having many textures might have a bad impact on performance, because if you first draw a Button and then a TextBox the GPU will have to change textures. 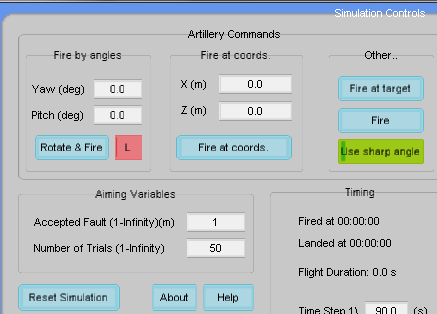 The first place where I used my gui was an artillery simulation project in XNA. But before getting deep inside the gui of the simulation an idea came to my mind :D.
Why troubling myself with writing 1** lines of code for a single form while I can generate the code from Microsoft Visual Studio?? I’ll have to admit it’s a little lame to use the Visual Studio designer but I found it better than wasting time programming a designer :). -Running a pre-made Visual Studio project (windows forms application) with a reference to the dll FuchsGUICodeGenerator ( Looooooooong name :D). -Creating a new Windows.Forms.Form in the project. -In the file Program.cs choose the form you created (more details later). -Compile & run the project. -A pre-made form will show and ask for generation options. -You click a button and a complete class code is generated & copied to clipboard on demand :D.
We’ll recreate the calculator from Part III. In part 2, I demonstrated how to create two types of FuchsGUI controls : Button & TextBox. Well, most FuchsGUI controls have similar constructors, this lesson should be quite simple, what we will do is a simple calculator that adds\subtracts two numbers, the reason for this is to show you how to get values from TextBoxes & how to use Forms. Okay! let’s get our hands dirty :D.
a-Creating a new XNA4.0 game and preparing it to use FuchsGUI. b-Adding two Buttons and one TextBox. c-We want to achieve the following : when a button is clicked, the text in the TextBox will change to the name of the clicked button. -The tutorials are for the XNA4.0 version, it’s just a matter of default parameters ( which are not -AFAIK- permitted in .NET3 c# ) , if you’re still using XNA3.1 maybe it’s time to move on :). -This post doesn’t contain the FuchsGUI dll, please wait for the next post, but I really recommend reading this post if you’re willing to use my gui :). An important thing any game or simulation needs is a good, reliable & simple graphical user interface (GUI), of course you can use System.Windows.Forms to create a gui for your XNA game but to me I prefer a gui from within the game, XNA code only :D, with this you can place the gui controls anywhere in the game window (I don’t know if it’s possible with Windows forms). -ALRIGHT get to the the point already!! !